Well, 1 Voice is certainly not concerned about you getting brain cancer, but like a loving and protective mother, they are concerned about you keeping your sweet little earsies warm and preventing body heat from escaping through your head while you jam to your jam. It’s January, folks, and in some parts of the world, it’s freakin’ frigid out there. Enter the skullcap with integrated Bluetooth audio. No more freezing while listening to tunes when jogging, waiting for the bus, snowboarding, or generally doing your thing in cold weather. No more pulling your beanie over your headphones and creating discomfort and bulges in your head ware. 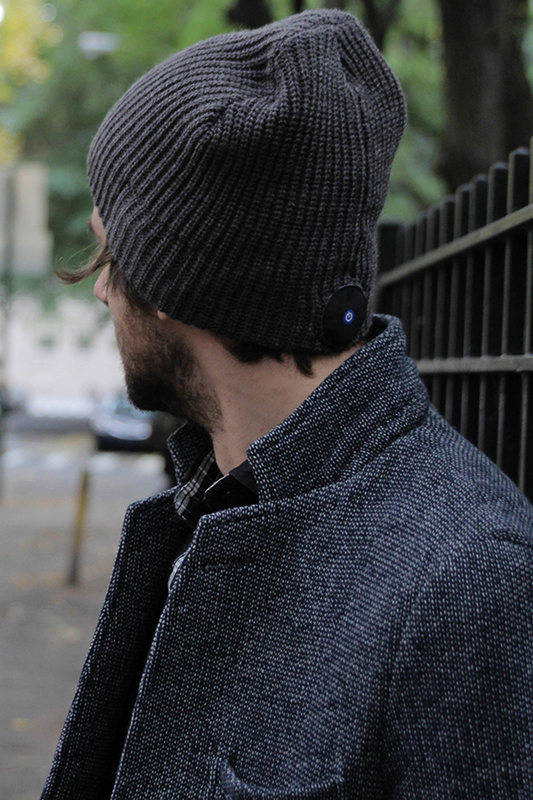 No more headphones over your beanie, dampening your sound. With the “1 Voice Beanie“, headphones have been sewn into the inside of the skullcap. A Bluetooth controller is attached to the back and is used to establish a connection to your mobile audio device. Hold the center button on the controller down for three seconds and watch the controller light up, signaling that your Bluetooth beanie is discoverable and ready to be paired with your device. Then search for and select the “1 Voice” connection in your device’s settings and you’re ready to rock ‘n’ roll, rap ‘n’ roll, rhythm ‘n’ roll, or whatever it is you youngins do these days. Slap it on your thick noggin and enjoy at least six hours of continuous audio playback before you need to recharge it. This thing could make for an interesting hands-free calling option while in the car, as well. The rechargeable “1 Voice Beanie” is hand-washable, according to the FAQ, and machine washable according to the product page, so we’re not sure what to tell you there. One Q&A on Amazon.com mentions that you can do either, but be sure to remove the headphone disks and Bluetooth receiver first. While the parts are water-resistant, allowing you to utilize the beanie safely for snowsports and the like, they are definitely not waterproof and you may damage them if you submerge them in water. Basically, don’t go snorkeling in your bathtub with the darn thing. You can get yours within 2-7 days of ordering, depending on where you’re at. The “1 Voice Beanie” ships out of New Jersey. Get one in the color of your choice and ditch the wires, the separate headphones, and the cold. Shopping Tip: There are similar products out there on the market, including those made by Tenergy and Rotibox. Search for “bluetooth beanie” on Amazon.com to get an idea of your options.